What is Computing at School all about? Its is a organisation who's job is to develop support and training for teaching Computing and in particular the computer science aspects of the new curriculum. They where one of the organisations who worked on the proposed curriculum and have been recently funded by the DfE. What is a CAS hub? 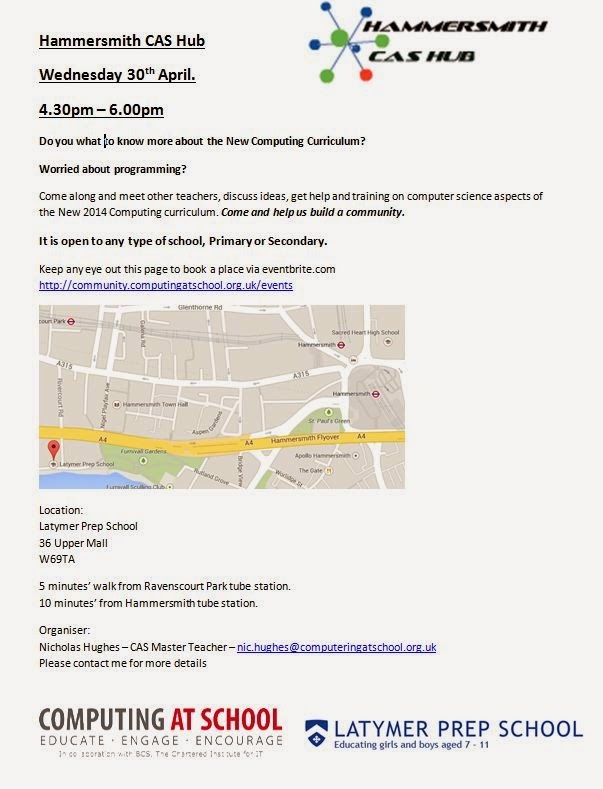 Its is a community of teachers who come together to develop and share ideas for the teaching of computing. Its about helping and supporting one another. Different hubs can work in different ways but the important thing is that after a session you should leave excited and with a new idea to use back in school. Details for the Hammersmith CAS hub which I am running is below. I have many ideas all the time. But if I has to share one at the moment is to look at and use the code.org site. It is great, it has loads to great step by step guides and tutorials and links of where to go next to further explain your knowledge. Great for teachers and Pupils.